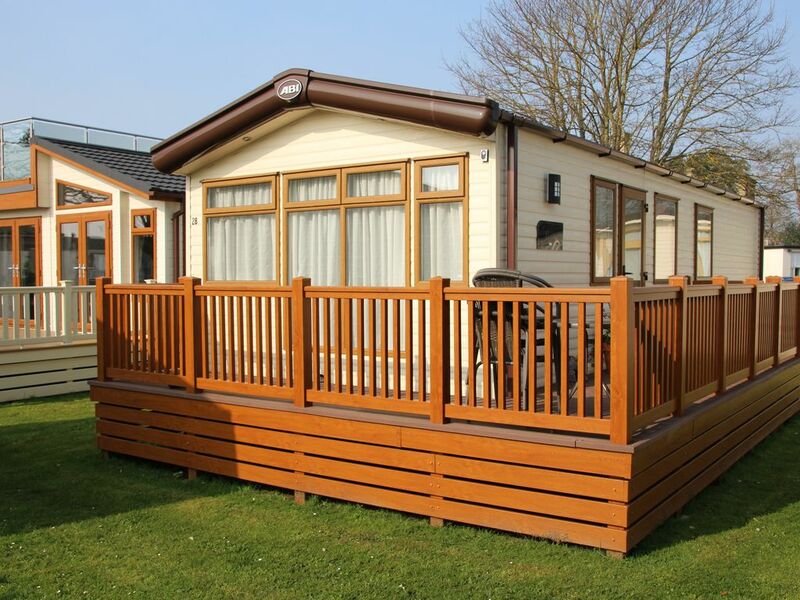 Bel Endroit is a two year old holiday home situated on the popular Sandhills Park in Mudeford (plot 28). Bel Endroit means "nice spot" in French and we certainly think it is. Avon Beach is 50 yards away; close enough to be able to enjoy the beach but far enough away to be peaceful and sheltered from the wind. From the decking outside you can see the Isle of Wight and The Needles and the front deck enjoys sun from early morning until late afternoon, making it the perfect place to enjoy breakfast or sit out and relax. Bel Endroit is equipped to high standards with everything you need to have a peaceful, relaxing holiday. Towels/linen/T towels are provided but we ask that you bring your own beach/pool towels. There is a private parking space 30 yards away, making it easy to unload your belongings. The communal facilities are available for you to use - heated outdoor swimming pool, clubhouse with bar, Sky television and small gym. There is also a shop stocking basic items and launderette on site. WiFi is free in the clubhouse but can be accessed from the holiday home on a pay as you go basis. Please note this is provided by a third party and as such we have no control over the WiFi performance and reliability. This stunning area has everything you could want to make your holiday enjoyable and memorable. Bournemouth is a half hour drive and has plenty of shops for those wanting to do some retail therapy. Poole is a little further on with its historic quay and its famous Poole Pottery. The New Forest is not far away with its stunning scenery, ponies and gorgeous villages to explore. Lymington is also half an hour away in the other direction (one of our favourite places) and here you can take a ferry over to the Isle of Wight or saunter around the Saturday market. Mudeford is a gorgeous place to stay, with the hustle and bustle of the quay where the children can go fishing for crabs, Avon Beach right outside and a short ferry ride to Hengistbury Head which is ideal for walking or cycling. Christchurch is only a few miles away with plenty of shops and, of course, the beautiful Priory and the river. There is something for everyone to enjoy in this stunning place; watersports for the energetic or just sit and relax and read a book. Full professionally laundered bed linen is provided and the beds are all made up. This property has an allocated parking space. Parking permits need to be obtained from reception. Free in the clubhouse. Third party pay for access service within property. Quality and speed of service cannot be guaranteed as outside of property owners control. A hand and bath towel is provided for each guest along with hand towels in the bathrooms. There is also a tea towel in the kitchen. The accommodation was clean and comfortable. The site location was ideal for the beach and Mudeford Quay. We enjoyed the site facilities especially the pool which was warm and supervised. It was only a short visit but very enjoyable with perfect weather. Thank you very much for taking the time to review 'Bel Endroit', it is appreciated by the owners and all the Mud Huts team. We are so pleased that you found the property to your liking. The site facilities and pool do add that little extra and the proximity to the beach is the icing on the cake. Do come back and see us again soon for a longer stay.